Excel is one of the best tools to make complicated works easier with the help of simple formulas. It also helps us to round off complicated numbers with multiple decimals. Let’s find out how. 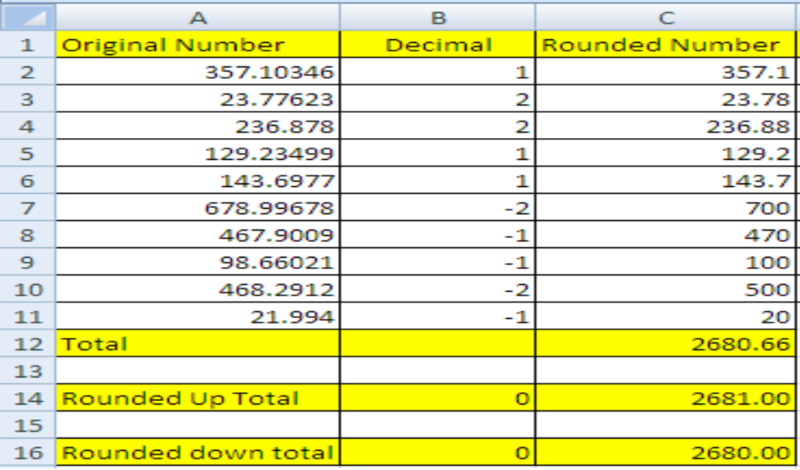 Column A has the numbers that need to be rounded off and Column B has the number of decimals up to which we want to round off the original number. Enter the formula =Round(A2,B2) in C2. Copy cell C2, select column C and select the option of “pasting formulas” to apply the formula in every cell of C.
Excel will round off the original number when the number of decimals to be rounded is placed in column B.
Digits before the decimal point are integers and digits after the decimal point are decimals. To round up to the nearest 10 in decimals, we’ll write 1 in decimal column. We’ll write 2 in decimal column to round up to nearest 100 in decimals. To round up the integer to the nearest 10, write -1 in the B cell next to original number. Write -2 to round up the integer up to nearest 100. Put 0 in the next cell of the number to remove decimals from the total. Another way to increase or decrease decimals or to round off the original number is to simply click the option of increase/decrease decimal in the lower right corner of the “Number Section” in the toolbar.